Like most premium ice cream places, they serve by the scoop. The prices vary whether you take their regular or sugar-free or artisanal items. 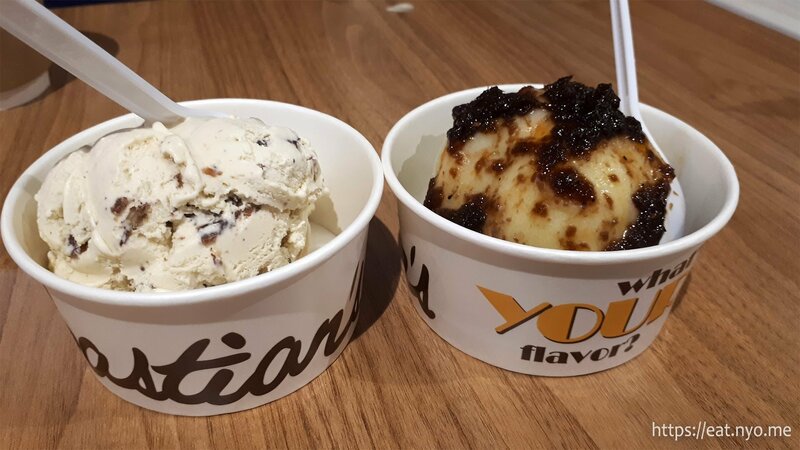 The reason we went there was because I wanted to try one of their unique flavors: the Green Mango Sorbet with Bagoong (120 Php). Beloved, who doesn’t like mangoes in general, went for the safer Butter Pecan Ice Cream (95 Php). While Beloved’s Butter Pecan Ice Cream, on the left, was above-average when it comes to the ice creams we’ve had the chance to try, it’s a pretty boring flavor compared to my choice. It does deliver a nutty and buttery taste, so if you like how the flavor the sounds like, you’ll probably enjoy this as Beloved did. My Green Mango Sorbet with Bagoong, on the right, was literally that. The acidic green mangoes might not work as an ice cream, so the choice of icy sorbet was understandable. And it really was quite sour, like eating green mangoes in a cold, mushy form. It was also literally topped with bagoong or fish/shrimp paste. I can’t discern what kind of seafood it is, but it’s definitely sweet and definitely what they put on a green mango you can get out on the streets of Manila. While I like green mangoes, the texture turned me off a bit and I’d prefer the nice crisp bite of a real mango instead. I like it taste-wise though. Beloved hated it. The next adventure was months later before going to a soon-to-be-reviewed Korean Barbeque place in Regis Center, where Sebastian’s also has a branch in. A similar situation happened where I chose an unusual flavor in Champorado at Dilis Ice Cream (95 Php) and Beloved ordered their Cereal Milk (95 Php). The Champorado at Dilis Ice Cream, on the left, was very fudgy and sweet. Too sweet. The champorado or chocolate rice porridge was essentially turned into ice cream form, although I was surprised with how fudgy it was, almost like eating cold brownie batter. While I hoped the dilis, or small dried fish, would add in a bit of saltiness to balance it, it was actually candied and I found it quite sweet. There’s nothing scary or unusual here flavor-wise, which is overall similar to thick sweet chocolate ice cream, and the dilis was practically like the usual candied sprinkle toppings. I’d recommend this to those with a sweet tooth, as even Beloved liked this flavor. Beloved’s Cereal Milk Ice Cream, on the right, was similarly boring to the Butter Pecan she tried before. Admittedly also up there when it comes to quality, as it was quite milky. I’d describe it as Kellogg’s Frosties in ice cream form. Beloved and I similarly enjoyed it, and I honestly liked this better than my sweeter choice. Note that these ventures happened months ago, and inflation might have altered the prices significantly; I’d expect it will still maintain the same experience sans price, though, so I decided to publish this. 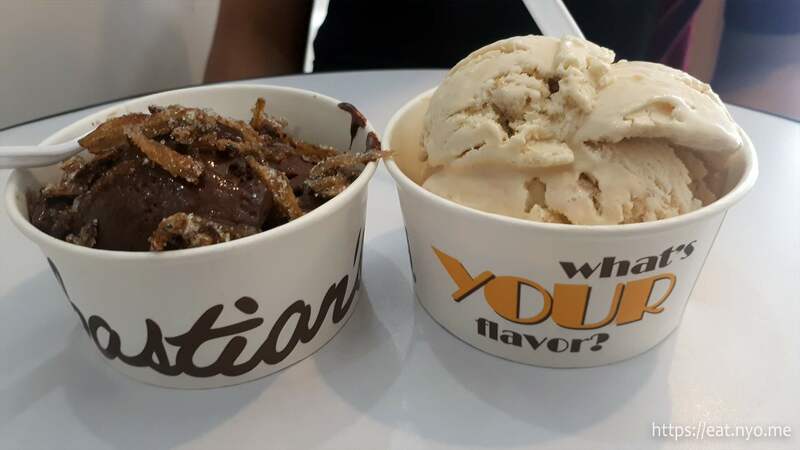 What separates Sebastian’s from the competition is the flavor choices when it comes their ice creams. I can compare it a lot like Papa Didi’s, which also serves unique flavors. However, Sebastian’s might have an edge to having the more unusual flavors. Another unique property is that it also serves hot grilled sandwiches, with an ala-mode option. One flaw is the price point, which is slightly above the competition’s per scoop standard. However, it’s definitely not the most expensive we’ve seen. If you’re into weird dessert flavors, Sebastian’s is definitely worth a try. Recommended for: Ice cream adventurers. Not recommended for: Non-adventurous dessert flavors. Smart nomnomnom tip: Take the flavors literally.